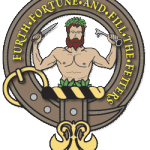 This is the Clan Murray Badge as realized by Will Murray (“Willscrlt“). The image is an original, copyrighted work featuring shadowing. It is 250×300 pixels in size and set against a transparent white matte background. Additionally, smaller (80×80 px) transparent versions in PNG and GIF formats also are available without shadowing. 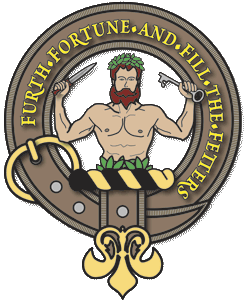 Clan Murray Badge by Will Murray (Willscrlt) is licensed under a Creative Commons Attribution-ShareAlike 4.0 International License. These low-resolution images are freely licensed for use as described below. High-resolution and vector image versions are available under a separate commercial use license. Discounts on commercial licenses will be considered based on the particulars of the situation for established Clan Murray organizations and certain charitable organizations. Please inquire directly with the site owner for more information. In a nutshell, you may use this image in any manner you choose, so long as you (1) provide attribution to the creator as described below, and (2) if you redistribute the image, you must distribute it using the same license. Copyright ©2006-2015; Licensed under a Creative Commons Attribution-ShareAlike 4.0 International License. If space is very limited, the third line (the Source) may be omitted. If space is extremely tight, you may substitute the preceding notice with the following notice, which is the minimum notice deemed acceptable under the terms of this free license:©WillMurrayMedia.com; CC BY-SA-4.0 licensed. The country of first publication and copyright is the United States of America. All rights not granted by the CC-BY-SA-4.0 license are reserved by the image’s creator. Click or touch the image you want to download. Depending on your browser, you may need to right-click or long-press the resulting image and choose Save Image.